One of The Guardian newspaper’s Best 20 Yoga Holidays Worldwide. Literally float your troubles away on this extraordinary retreat in one of the most spectacular natural settings in the world! Ditch the devices for a week and connect to the resonance of the natural world with Sarah's grounded, exploratory, slow flow. "This is the most beautiful and unique introduction to both Thailand and yoga I think anyone could have; a special place in the world that very few humans have ever discovered - I haven’t stopped eulogising about it since I went!" Late February is a wonderful time of year to visit the region. Right in the middle of the dry season, there is consistently warm weather, some hot weather and very little rain. And no mossies! 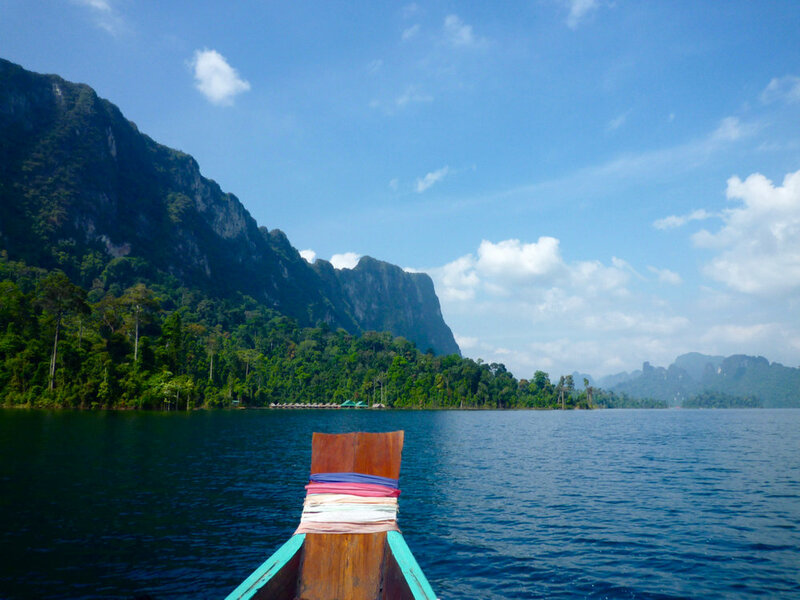 Sarah will teach twice-daily yoga on the floating shala with views across the lake. Morning classes will be dynamic yet slow-paced, in keeping with the flow of nature. Evening practice will be explorative and restorative. All practices focus on breath and connection as well as developing an awareness of your individual internal processes and establishing your own best practice. 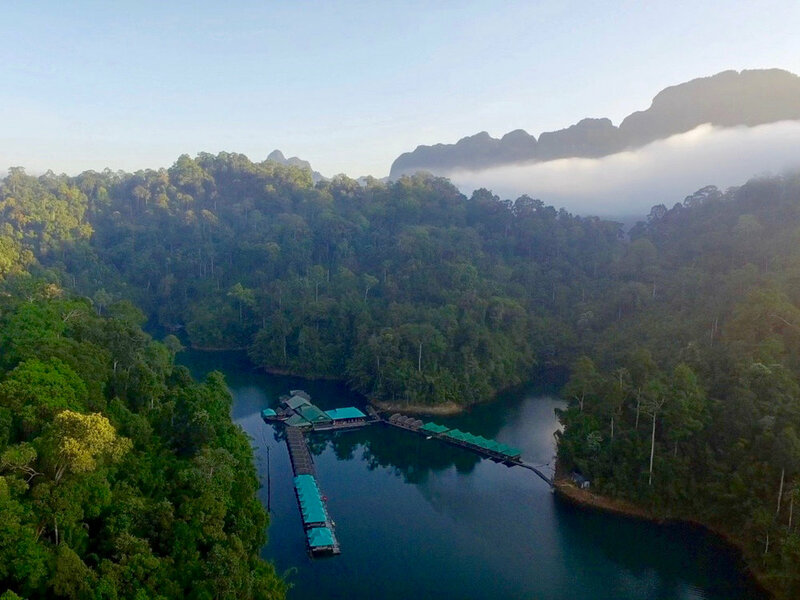 Between classes, there is plenty of time for swimming, kayaking, trekking to the nearby secluded lake to explore the caves, and spending hours slowing down, reading, chatting and admiring the views! Two fantastically skilled Thai masseuses will be resident during the retreat to enhance the effects of your practise and to help you get into those hard to reach areas. A yoga retreat with space to rediscover your creative flow. We will meet at Surat Thani airport at 9:25 am for our transfer to the lake location. If you are travelling around and want to arrive in Surat Thani the night before or early morning be sure to be outside arrivals at the Surat Thani Airport (URT) by 9:25 am. Our drivers will be waiting with signs to pick up the group. If you have to arrive outside the group arrival time then separate transfer booking can be arranged but will be an extra cost. We will be greeted at the lake by our Jungle Yoga hosts who will show us to our jungalows and talk us through the location. Sarah will also talk us through the week ahead. This is a great opportunity to discuss any injuries or personal issues with your teacher (though there is also a chance to let us know any concerns or injuries in advance on the booking form we will send you). Departure day. On the morning of the 2nd March, we will have an early breakfast then leave the retreat location at 6:00 am. Our transport will leave the pier at 7:00 am to arrive at Surat Thani airport at approximately 8:15 am in time for the 9:35am flight to Bangkok.